EPI-SHIELD®, a balm, has a unique three part topical system that contains an emollient to help moisturize skin, a vegetable-based plasticizer to promote skin conditioning, and contains LAURICIDIN®, an ingredient sourced from coconut oil. Free Shipping with Every Lauricidin® U.S. Order! Benefits of LAURICIDIN® in an easy to apply moisturizing balm. Supported by over 30 years of testing and clinical research. A Formulation You Can Trust – Get all of the benefits of LAURICIDIN® in an easy to apply moisturizing balm. Gentle Toughness – EPI-SHIELD® provides a molecular barrier between the outside environment and your skin. The effects of Epi-Shield® last for up to 8 residual hours following topical application. Shield Against the Elements – EPI-SHIELD® is perfect for anyone who works with their hands, spends a lot of time on their feet, is frequently exposed to the elements or simply enjoys having smooth, moisturized, comfortable skin. Research Tested – EPI-SHIELD® has been supported by over 30 years of testing and clinical research. Main ingredients: Lauricidin® (glycerol monolaurate) 1%, Propylene glycol monocaprylat 1%, Lactic Acid 2%. Other ingredients: Petrolatum, Lanolin, Beeswax, C12-15 alkyl benzoate, cetyl alcohol. 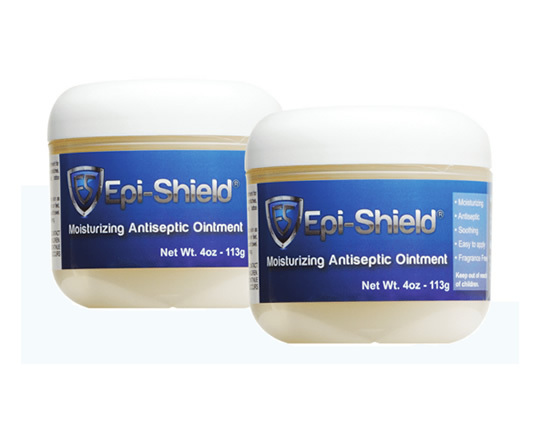 Although EPI-SHIELD® has been around for over 30 years, it has not been commercially available to you until now. Try EPI-SHIELD® for yourself and if you are not pleased, send it back to us and we will gladly refund your money. Med-Chem Labs, Inc. uses the USPS and UPS as our preferred partners and modes of shipping. All orders received by 1 pm. PST, Monday – Friday will be processed and shipped that day. All orders received after 1 pm on Friday, Saturday or Sunday, will be shipped the next business day. Orders will be shipped to PO boxes by USPS. Where does your product ship from? We ship from Southern California and Delaware. Yes, we will ship to international locations and we have a global network of health professionals who recommend Lauricidin® to their patients. Shipping times will vary. Still have a question? Call us directly to have your question answered.